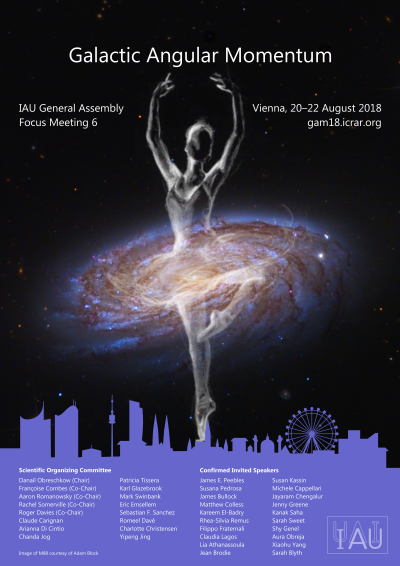 The 30th General Assembly (GA) of the nearly-100-year-old International Astronomical Union (IAU) started this past Monday, August 20 in Vienna, Austria. This event is held every three years; the previous General Assembly was held in Honolulu, Hawaii in 2015, and the next one will be held in Busan, South Korea in 2021. The GA runs for two weeks (M-F), and in addition to many science sessions (with both oral and poster presentations), also includes policy and business activities, as this is the body that defines, for example, what a planet is, and what current planets do or do not fit the new definition. One of the decisions to be made at this meeting is whether to rename Hubble's Law. The science program for the meeting is available in several formats offering different levels of detail, including a free app which is updated as things change. The science offerings are arranged into two main formats: symposia and focus meetings. For both of these, think "meeting-within-a-meeting." Symposia are longer events spanning multiple days and each symposium has one plenary session; focus meetings can span more than one day but do not have plenaries. As the IAU is the international governing body for astronomy, its individual members are structured into Divisions, Commissions, and Working Groups. The General Assembly includes Division Meetings which may have oral and poster science presentations and/or Division business sessions, and there are also a few other presentations (Gruber award plenary, invited discourses, and so on) offered. So far as I know, no one is live-blogging the event. Okay, so the above is a general announcement about this event, which has just over 3,000 people from 88 (!) countries in attendance and, like the Olympics, has a formal passing of the baton, with national flags involvement, in a closing ceremony. Or so I've been told; this is the first time I've attended an IAU anything. Now let me tell you what it's like: it's hot. Vienna's been hot all week, and, because the GA is certified as a "green" event, it is hot in the initially-massively-confusing venue, too, as only the lecture halls are cooled. I almost always feel cold and keep my house fairly warm in the summer -- 77-78° typically. And I have been roasting all week. Toasty toasty toasty! I was asked when I registered which Symposia/Focus Meetings (FM) I wanted to attend. I marked something, but whatever they were, I do not remember. I am skipping from topic to topic, having attended talks in the Dwarf Galaxies: From the Deep Universe to the Present and Origins: From the Protosun to the First Steps of Life Symposia and in the Radio Galaxies: Resolving the AGN phenomenon, Galactic Angular Momentum, Calibration and Standardization Issues in UV-VIS-IR Astronomy, and IAU’s role on global astronomy outreach: the latest challenges and bridging different communities Focus Meetings. Tomorrow and Monday are Division meetings; I'll attend the Division B meeting as that is the one that covers software. I also have a poster up, so will be there during the poster session times. which I want to win with all of my hard little dried-up heart, at least as much as the pony that was being raffled off when I was at Chincoteague as a 9-year-old. Swag has included Tim-Tams from at least two Australia booths, a folding fan with astro images from a South Korea booth, tea from the LAMOST (telescope) site, various tee-shirts, buttons, pens, luggage tags, mints, star-shaped post-its, etc and so on, and though not quite swag, champagne and beer to celebrate journal anniversaries. Mostly what I'm here for is the Division B meeting and poster presentation and meetings with editors/publishers/people; that said, I'm glad I've had time here to attend some of the science sessions, as that doesn't always happen. I don't have Twitter, but I thought I would check this out, since I supposedly don't need an account. But I was told that I should log in or sign up if I wanted to read more. It is a lovely poster indeed. That should bring up the "top" tweets for that hashtag. From the menu at the top of the page, selecting "Latest" should give you the tweets with newest one at the top. With many parallel sessions and everyone using (mostly) the same hashtag, narrative flow will be in short supply. I think you might also be able to click on an account name to see just that account's tweets; that, and clicking on "Show thread" when you want more context, should help give you more of a narrative for something specific. In addition to tweets from/about conference sessions (and sometimes food), there is tweeting from the contenders for the IAU 2024 General Assembly site, Mexico and South Africa, both of which have active exhibition booths. Interesting! Ah, to be able to listen in to the seminars. Me being me, I found another version of the "ballerina galaxy" among the tweets, a more stylized one, and me, being me, I was happy to confirm my suspicion that the galaxy used for the image is M88, in a picture taken by Adam Block.